Minster's Jarod Schulze shoots as Anna's Griffin Doseck defends during a nonconference game on Saturday in Minster. Minster's Mike Ketner shoots during a nonconference game on Saturday in Minster. Anna's Kamren Steward shoots as Minster's Jarod Schulze defends during a nonconference game on Saturday in Minster. Minster’s Jacob Salazar looks to get around Anna’s Kamren Steward during a nonconference game on Saturday in Minster. Heitbrink led Minster with 18 points. Salazar scored 14 points off the bench. Anna’s Griffin Doseck shoots as Minster’s Jacob Salazar and Cody Frericks defend during a nonconference game on Saturday in Minster. Doseck scored 19 points for Anna. Anna's Bart Bixler shoots during a nonconference game on Saturday in Minster. Bixler led Anna with 27 points. Minster's Mike Ketner drives against Anna's Bart Bixler during a nonconference game on Saturday in Minster. Anna's Carter Elliott shoots as Minster's Justin Nixon defends during a nonconference game on Saturday in Minster. Anna's Isaac Lininger shoots as Minster's Noah Enneking defends during a nonconference game on Saturday in Minster. Minster's Mike Ketner and Anna's Riley Huelskamp scramble for the ball during a nonconference game on Saturday in Minster. 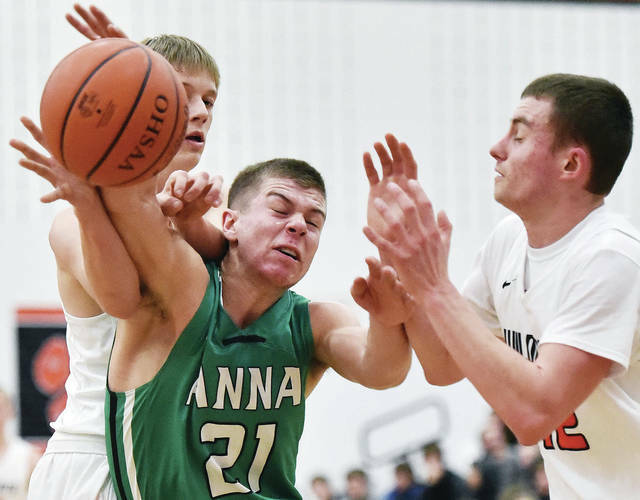 Anna's Bart Bixler drives against Minster's Noah Enneking during a nonconference game on Saturday in Minster. Minster’s Jack Heitbrink weaves between Anna’s Kamren Steward and Carter Elliott during a nonconference game on Saturday in Minster. Heitbrink led Minster with 18 points. Anna's Riley Huelsamp and Minster's Noah Enneking and Mike Ketner become entangled during a nonconference game on Saturday in Minster. See more photos from Minster and Anna’s game here. 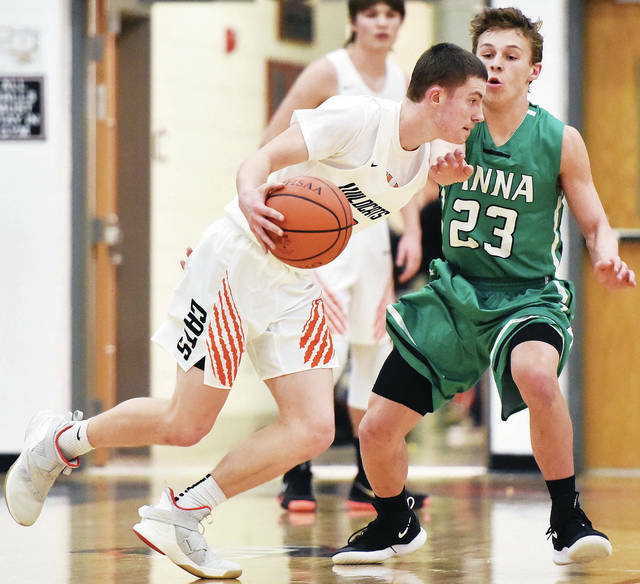 MINSTER — Minster was in foul trouble for almost all of a nonconference showdown with state-ranked Anna on Saturday and had several first-year varsity players step up and make huge plays. With the game on the line in the final seconds, though, it was one of the team’s veterans that came up with the biggest. 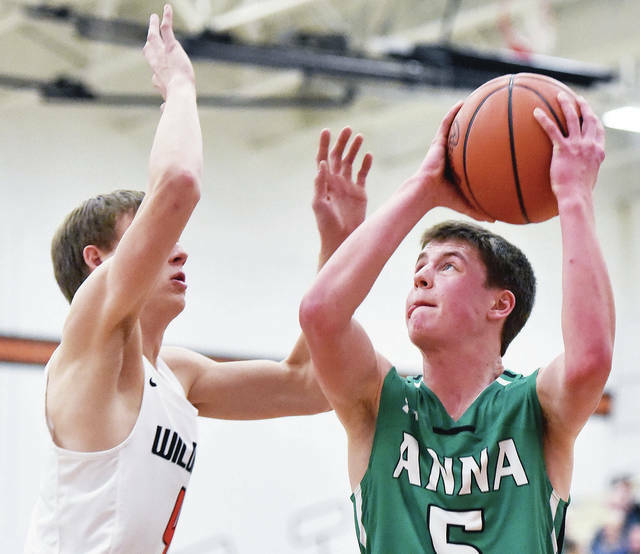 Mike Ketner, a three-year starter, drove inside between two Anna defenders after a screen was set, jumped up and hit a floater with a second left to give the Wildcats a 66-64 victory. The shot was an exclamation point on what was largely a quiet scoring weekend for Ketner. The senior point guard entered the weekend with an average of 13.5 points per game but scored six points in a two-point loss to St. Henry on Friday and finished with nine on Saturday. No matter his scoring output, though, Minster coach Michael McClurg said his presence is always felt. “He was a little worn down (tonight) I think,” McClurg said. “We don’t take him out much. He played all night last night in kind of a dramatic loss. 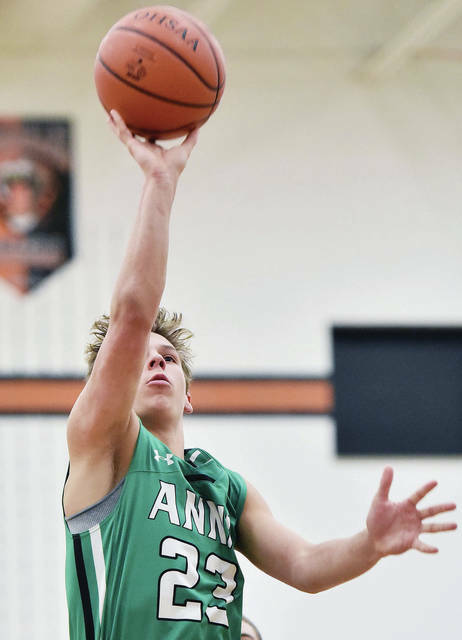 Ketner’s shot capped off a wild night that both McClurg and Anna coach Nate Barhorst hope was good tune-up for their squads before tournament play starts. The Wildcats (14-7) took an early 16-4 lead only to see the Rockets (19-2) battle back and take the lead in the final minutes. As happy as Barhorst was to see the team battle back, he was disappointed a rally was needed. The Rockets had a cold shooting start from the floor, and though they warmed up there, they never warmed up at the free-throw line. Anna, which was ranked No. 5 in Division III in last week’s state Associated Press poll, made 19-of-35 foul shot attempts (54.3 percent). “One thing we can definitely take away from it is we scrapped,” Barhorst said. “We scrapped, scrapped and scrapped. We did everything we could to get back into the game, and for that, I give credit to my kids. The Wildcats committed 26 fouls. Senior 6-foot-9 center Jarod Schulze fouled out and sat the bench for a good portion of the game beforehand. Senior forward Cody Frericks also committed four fouls and was on the bench more than usual. 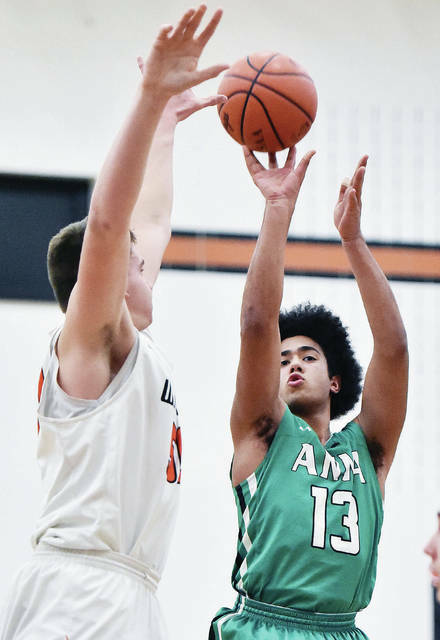 But Minster got an added boost off the bench from 6-4 sophomore forward Justin Nixon, who scored 10 points and had seven rebounds. 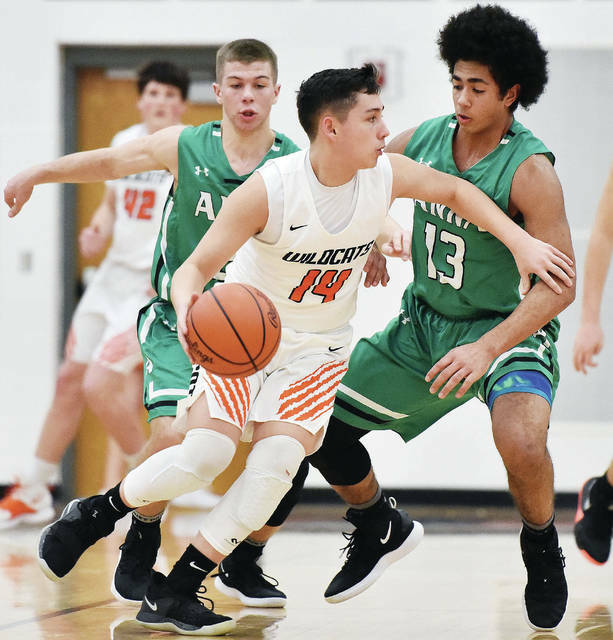 Junior guard Jacob Salazar scored 14 points off the bench, while senior starting guard Jack Heitbrink led the team with 18 points and brought down six rebounds. Frericks led the team with 11 rebounds, including a huge offensive rebound late that bounced off the foot of an Anna player. Minster led 31-24 at halftime and pushed its lead to 41-28 after a basket by Nixon with 5:03 left in the third. Anna scored the next five points, though, and pulled within 46-40 at the end of the quarter after a steal and layup by Bart Bixler. 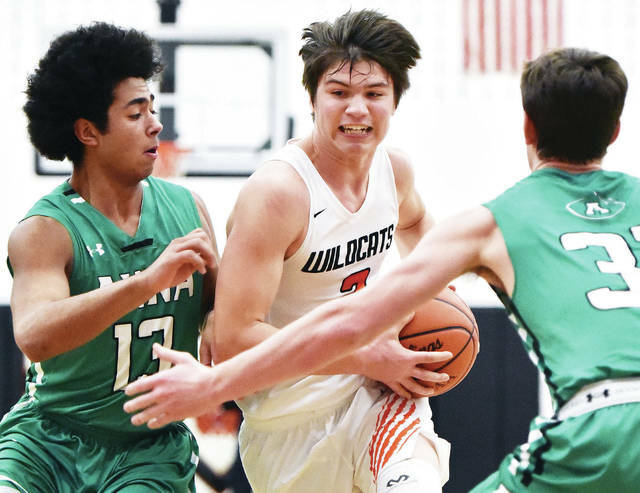 Griffin Doseck hit consecutive 3-pointers to open the third quarter and tie it up, but Minster quickly took control again. Salazar hit a 3 from the right corner and Heitbrink made a 3 from the right wing to give the Wildcats a 55-47 lead with 4:58 left. “We’re not used to that, playing from behind all game and having to fight and claw,” Barhorst said. “It’s good to go against it in a tough atmosphere over here. The Rockets quickly got back in it by responding with an 8-2 run. Kamren Steward hit a jumper with 1:58 left to tie it 59-59, then Doseck made a put-back 20 seconds later to give Anna its first lead of the game. Heitbrink made 3 from the right wing with 38 seconds left to give Minster a 64-63 lead, then Doseck split a pair of free throws with 13 seconds left to tie it and set the stage for Ketner’s last shot. Bixler led Anna with 27 points while Doseck finished with 19. Steward added nine. Minster dominated the first quarter. The Rockets couldn’t make many shots and the Wildcats ate up most of the rebounds. As cold as Anna’s shooting was, Minster’s was as hot. Salazar hit consecutive 3-pointers to put the Wildcats up 8-2 with 4:45 left. Nixon and Heitbrink added baskets in the paint in the final 90 seconds to give the Wildcats a 16-4 lead heading into the second. Nixon made a basket to increase Minster’s lead to 25-9 with 5:51 left in the second, but the Rockets found life on offense and got back in it before halftime. Anna hit 8-of-17 free-throw attempts in the quarter, started hitting baskets in the paint and finished on a 13-6 run to pull within 31-24 at halftime. Even with the big early lead, McClurg said he wasn’t comfortable. 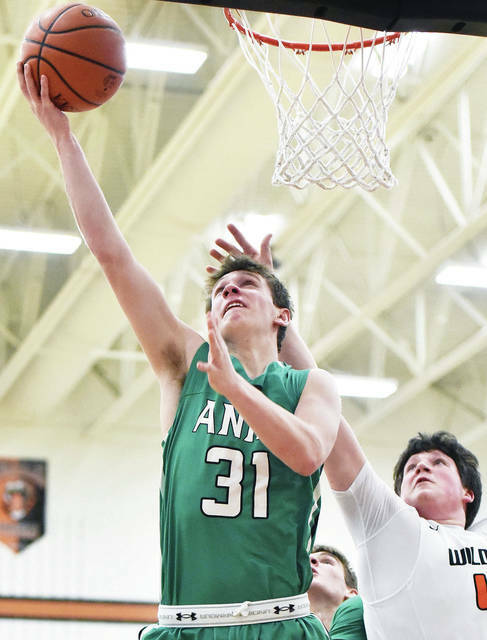 Anna will wrap up Shelby County Athletic League and regular-season play on Tuesday at Russia. The Rockets, which are the No. 1 seed in the Dayton Division III sectional, clinched the SCAL title outright on Friday as a result of Fairlawn’s overtime win over Jackson Center. Barhorst said that won’t detract from motivating the team to beat the Raiders, which swept Anna in SCAL play last year after winning a pair of games on last-second shots. The Rockets won this season’s first matchup 58-52 on Jan. 22. Minster will wrap up Midwest Athletic Conference and regular-season play on Friday at home against Parkway. The Wildcats are 5-3 in conference play and tied for fourth with Coldwater. Anna will open tournament play next Saturday against No. 21 seed Carlisle and Northmont’s Thunderdome. Minster, the No. 3 seed in the Wapakoneta Div. IV district, will open tournament play against Fort Recovery or Waynesfield-Goshen on March 1 at Coldwater. 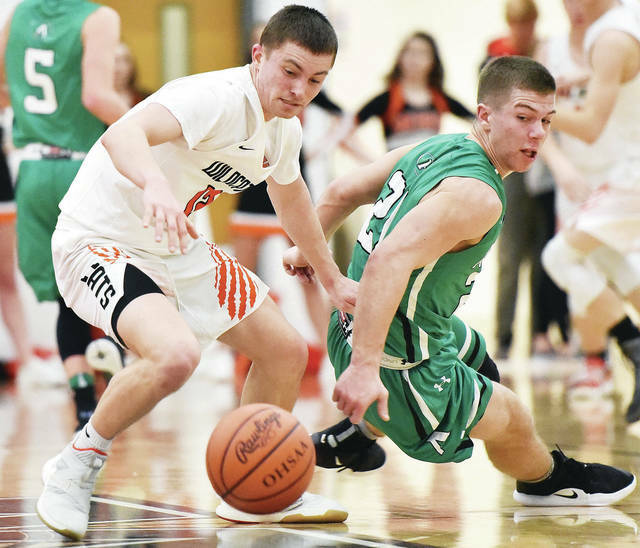 Coupled with Friday’s 54-52 loss to state-ranked St. Henry in MAC play, McClurg thinks the weekend was a good experience for Minster. 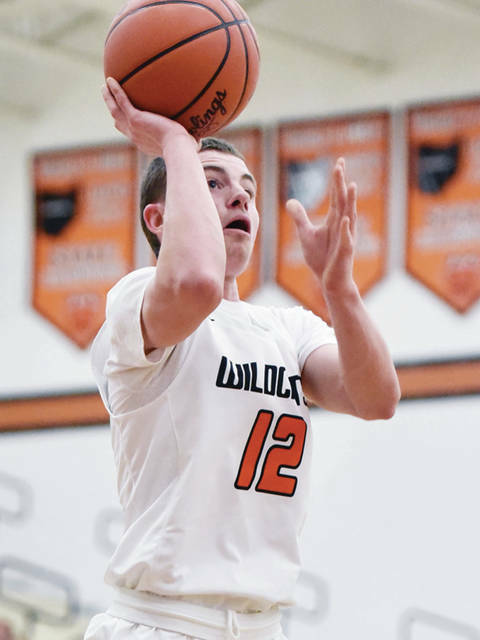 Minster shot 22 for 45 (48.9 percent) from the field and 13 for 22 (59.1 percent) from the free-throw line. Anna shot 21 for 46 (45.7 percent) from the field. 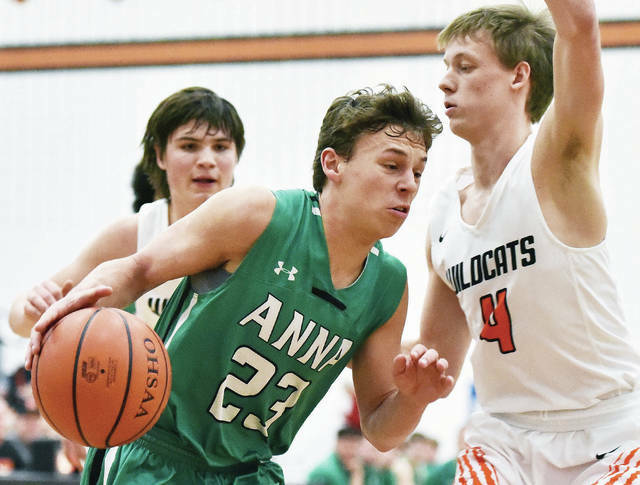 The Wildcats outrebounded Anna 33-17 but had 22 turnovers compared to the Rockets’ seven. Minster’s Jarod Schulze shoots as Anna’s Griffin Doseck defends during a nonconference game on Saturday in Minster. Minster’s Mike Ketner shoots during a nonconference game on Saturday in Minster. Anna’s Kamren Steward shoots as Minster’s Jarod Schulze defends during a nonconference game on Saturday in Minster. Anna’s Bart Bixler shoots during a nonconference game on Saturday in Minster. Bixler led Anna with 27 points. Minster’s Mike Ketner drives against Anna’s Bart Bixler during a nonconference game on Saturday in Minster. Anna’s Carter Elliott shoots as Minster’s Justin Nixon defends during a nonconference game on Saturday in Minster. 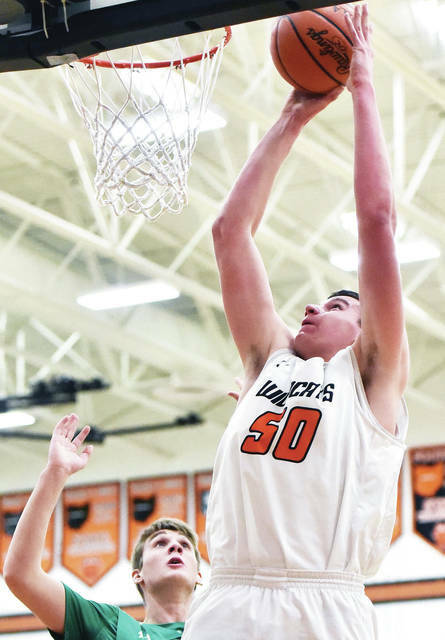 Anna’s Isaac Lininger shoots as Minster’s Noah Enneking defends during a nonconference game on Saturday in Minster. Minster’s Mike Ketner and Anna’s Riley Huelskamp scramble for the ball during a nonconference game on Saturday in Minster. Anna’s Bart Bixler drives against Minster’s Noah Enneking during a nonconference game on Saturday in Minster. Anna’s Riley Huelsamp and Minster’s Noah Enneking and Mike Ketner become entangled during a nonconference game on Saturday in Minster. 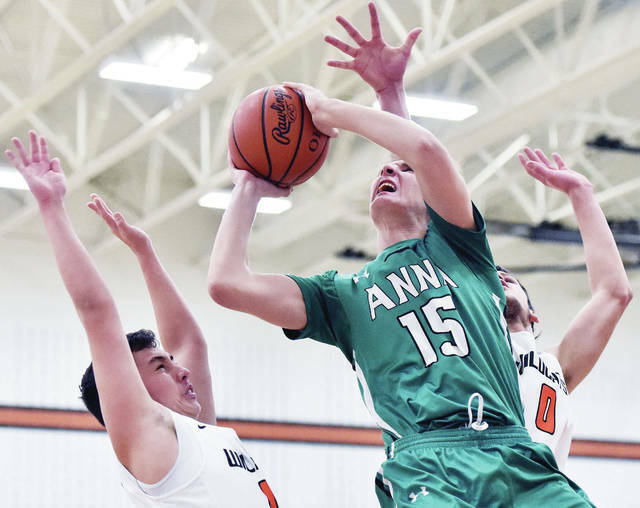 This entry was tagged Anna, article, Bart Bixler, basketball, boys basketball, Cody Frericks, Griffin Doseck, high school, hoops, image, images, Jarod Schulze, MAC, Michael McClurg, Midwest Athletic Conference, Mike Ketner, minster, Nate Barhorst, photographs, photos, picture, pictures, result, Riley Huelskamp, Rockets, SCAL, SCL, score, Shelby County Athletic League, Shelby County League, statistics, stats, who won, Wildcats. Bookmark the permalink.